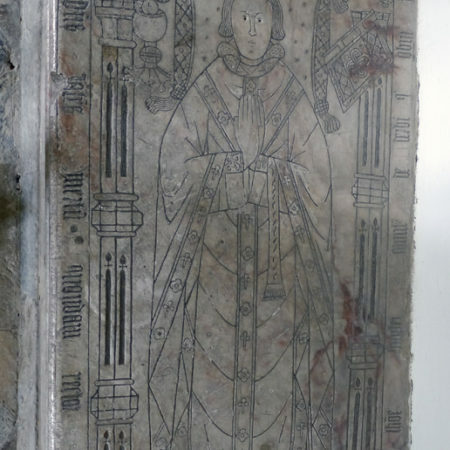 In a wall recess on the north side of the chancel at Whichford is one of the finest alabaster incised slabs to a cleric dating from the early fifteenth-century (Fig. 1). 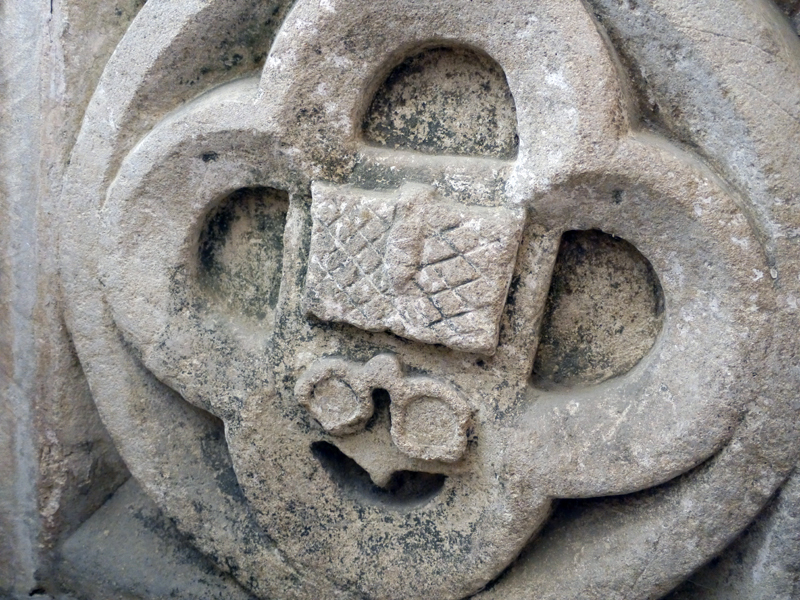 The recess in the north wall of the chancel between the windows is likely early-sixteenthe century and has jambs and four-centred arch of a double-ogee moulded order and a hood-mould.The main feature of the incised slab is a priest in mass vestments holding his hands in prayer and his head on a pillow with tassels at the corners (Fig. 2). On one side of the pillow is a chalice with a wafer in the bowl and on the other a closed book, presumably a missal. It appears to have a richly embossed cover. The priest stands underneath a triple canopy with an embattled top. It is a fine product of the Midlands alabasterers. 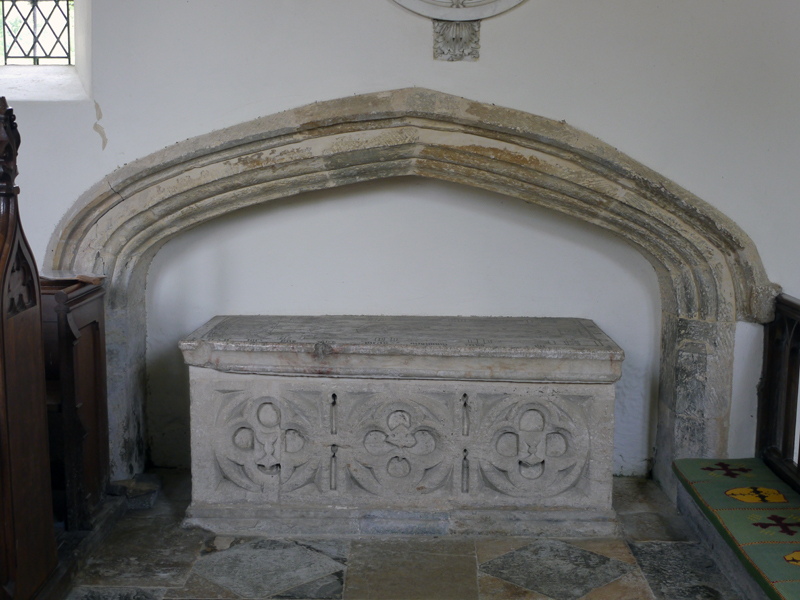 [Here lies Master John Mertun sometime rector of this church and former chaplain to Thomas Stanley Earl of Derby who died on such day …]’. Thomas was appointed rector of Whichford on 10 October 1507. 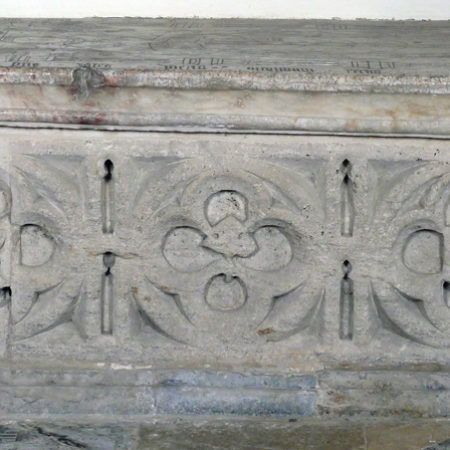 We do not know his date of death, which was never filled in on the top edge of the slab, but it was probably in 1537, when his successor was appointed. Evidently the monument was commissioned by Mertun himself in his lifetime; stylistic features suggest a likely date in the 1520s. 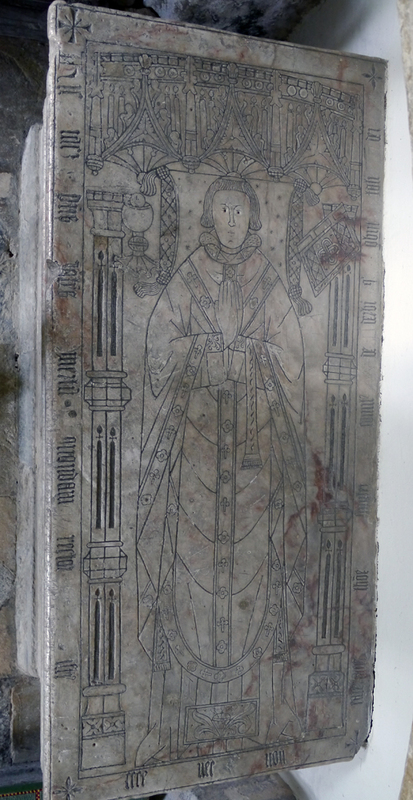 The incised slab is not the only element of interest in this monument. 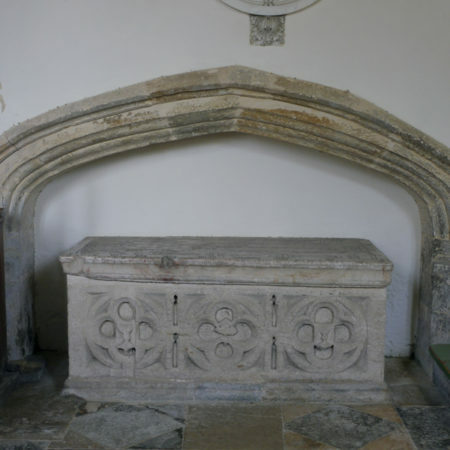 It sits on a tomb chest carved from oolitic limestone (Fig. 3). It is not Horton stone, from which most of the church is constructed, but one of a light creamy hue. The sides of the stone base are treated with quatrefoiled panels. On the front there are three; the central is embellished by what appears to be foliage, while those either side have chalices. That at the east end has a blank shield, but the one on the west is of most interest (Fig. 4). 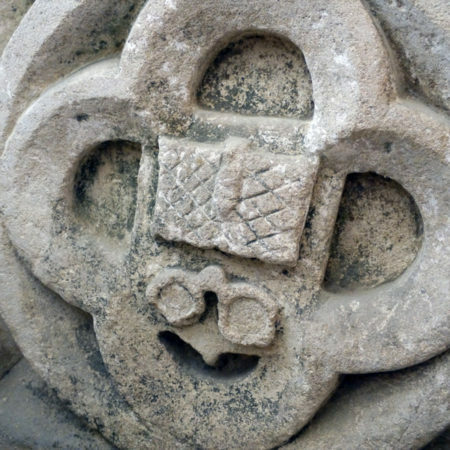 At the top of the quatrefoil is a book, the cover of which is decorated by cross hatching and which is held shut by a clasp. Below is a pair of pinch-nez or spectacles, a most unusual feature. 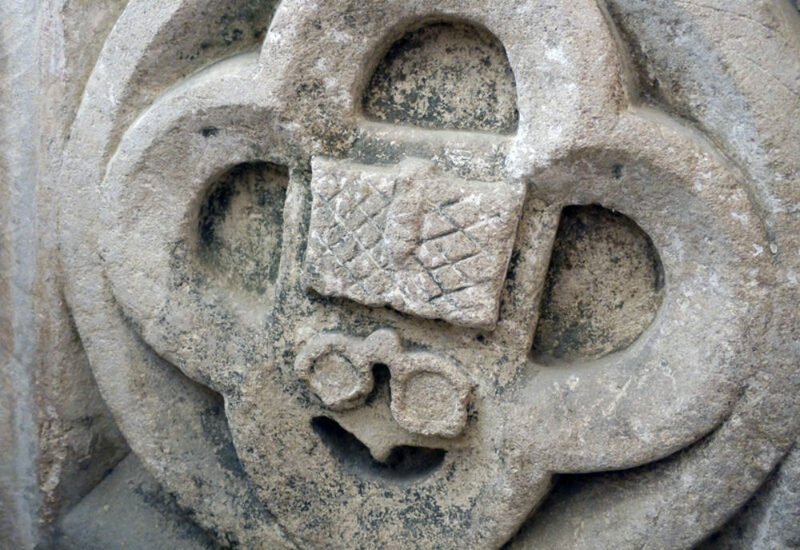 This is one of the earliest known representations of spectacles in English art. 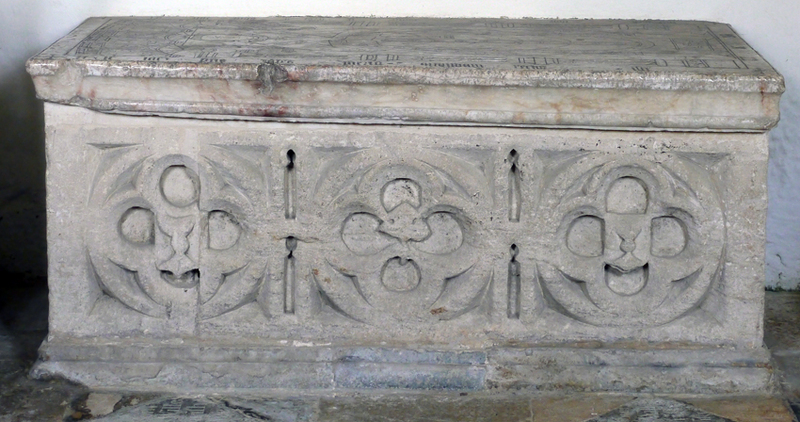 All in all, this monument illustrates how much can be learnt by looking at the details.